Seven months ago the first stills from Ron Howard’s Formula One drama, Rush, were released, but since then there hasn’t been a ton of promotion. That changes today, as we now have the first trailer for the film featuring Chris Hemsworth and Daniel Brühl. When the film was originally announced, I’ll admit I was only interested due to the cast and the fact Howard is directing, I wasn’t too excited about the story considering how many racing films end up following the same boring approach. After watching the trailer though, I’m sold and very excited. 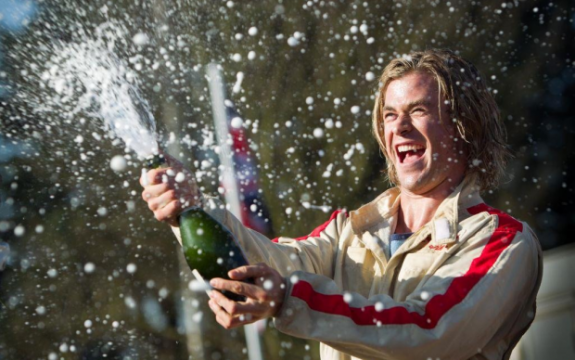 There seems to be an incredible story behind the racing here, and both Hemsworth and Brühl look to have roles they can shine in. For those who don’t know much about the plot, the film is about Englishman James Hunt (Hemsworth) and Austrian Niki Lauda (Brühl) whose clashes on the Grand Prix racetrack showed the differences in style between the two, which also held true in their personal lives. Some say their rivalry was the greatest the world ever witnessed, and this film looks to explore that intensity by showing the two drivers push themselves to the breaking point of physical and psychological endurance. Okay, so maybe that isn’t just your typical boring racing film. And this trailer is so exciting that anyone who isn’t sold by the plot should be by what this preview shows. The dialogue featured is incredible, and the footage looks great. The interactions between Hemsworth and Brühl are only briefly shown, but it’ll be interesting to see what the chemistry between the two is like on screen. If what we’ve seen in the trailer is any indication, it’s going to be pretty dang good. Rush hits theaters September 20, 2013 and also stars Olivia Wilde, Natalie Dormer, Alexandra Maria Lara and Christian McKay. What do you think of this first trailer for Rush? Share your thoughts in the comments section below.